Curtis “Talwst” Santiago, (pronounced “tall waist” — a nickname given to him by family friends due to his lanky physique as a child), was a promising young musician when he began making art on the side as way to combat the rainy Vancouver blues. After experimenting with various painting techniques, a friend handed him a small jewelry box and challenged him to do something with it. His first art show featured a series of paintings and a small collection of tiny dioramas built inside jewelry boxes. The paintings were well received but the ring boxes stole the show. Curtis "Talwst" Santiago (pronounced "tall waist" — a nickname given to him by family friends due to his lanky physique as a child) was a promising young musician when he began making art on the side as way to combat the rainy Vancouver blues. After experimenting with various painting techniques, a friend handed him a small jewelry box and challenged him to do something with it. 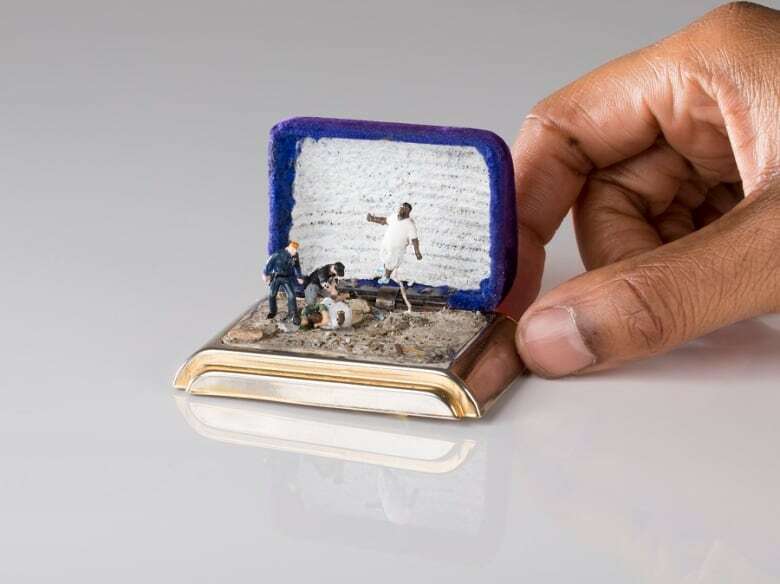 His first art show featured a series of paintings and a small collection of tiny dioramas built inside jewelry boxes. The paintings were well received but the ring boxes stole the show. 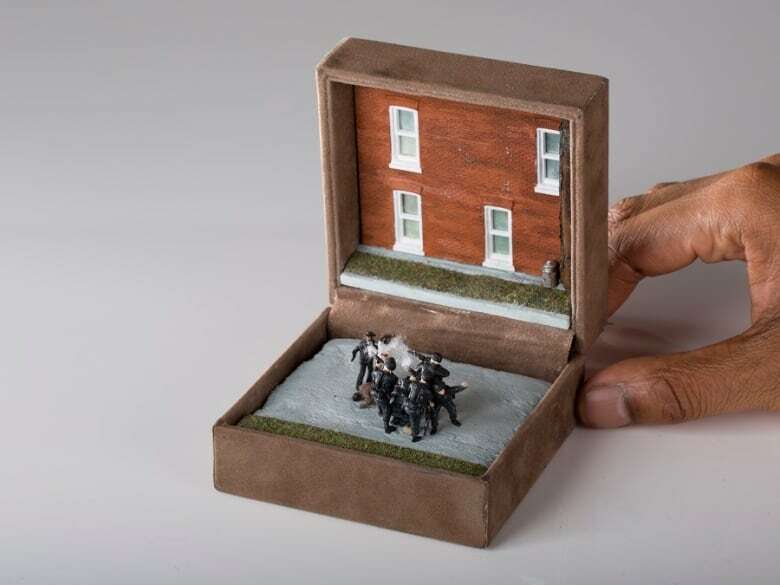 Now based in Toronto, Talwst has since exploded on the art scene, particularly after his dioramas were featured on Vancouver-based design blog booooooom.com. 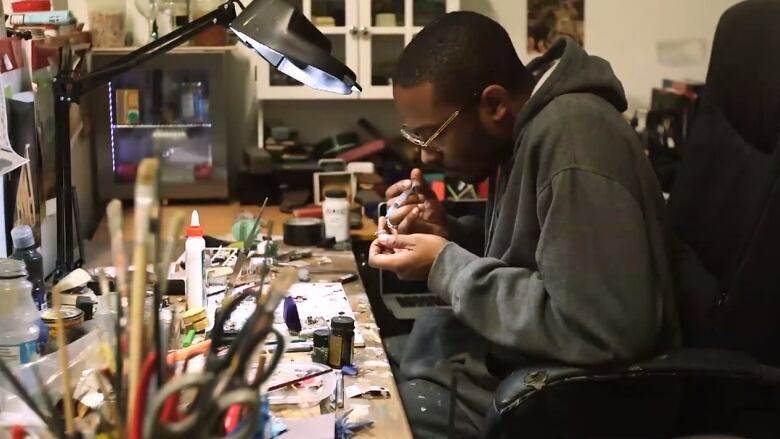 Images of his work went viral, and he has since been singled out on dozens of websites including Forbes,The Guardian, the Toronto Star and more, earning him a large following not only online, but also in the art world. He is currently showing at Toronto's Angell Gallery and is part of an upcoming exhibition called "A Constellation" at the Studio Museum in Harlem. His work may be small, but the subject matter it tackles can be big, often incorporating homage to art history (he loves the impressionists) and connecting it with current events and popular culture – from Kim Kardashian as the Venus de Milo, to depictions of the murders of Eric Garner and Michael Brown at the hands of police – two events that resonated strongly with the young black artist, who has himself been stopped and searched by police for looking "suspicious." In the upcoming episode of Exhibitionists, Talwst takes us on a tour of his favorite places to find materials to make his art and recounts his fascinating journey from the music world to the art world. The History of Touches is on display at Toronto's Angell Gallery until November 14. His work will be showcased as part of A Constellation at Harlem's Studio Museum from November 12 through March 6. Find Talwst at @talwst on Twitter and Instagram. A tribute to respected Toronto DJ Son of S.O.U.L.